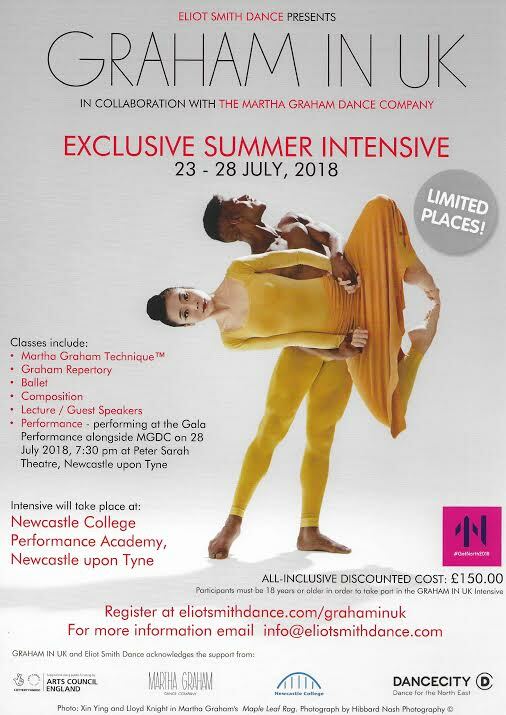 In partnership with the Martha Graham Dance Company and Newcastle College and in collaboration with Dance City, Graham in UK will offer opportunities from 23 – 28 July 2018 to professionals and community dancers to participate in classes, workshops and discussions focussing on the Martha Graham technique ; her repertory and legacy. GRAHAM IN UK will conclude with a Gala Performance at the Peter Sarah Theatre, Newcastle College, on 28 July 2018 at 7.30 pm, celebrating the work created throughout the project, and will include a performance by Eliot Smith Dance and The Martha Graham Dance Company, who will be performing an excerpt from one of Martha Graham’s classics. Summer Camp 2018 is organised by Orsolina 28 with the collaboration of Moncalvo in Danza. Focused on modern and contemporary dance with celebrated teachers from all over the world, the second week of this Intensive includes Graham classes with former company member Kim Jones and current Soloist of the Martha Graham Dance Company Lorenzo Pagano. Tecniche Di Danza Moderna International Summer Intensive will take place from July 23rd to July 28th 2018 in Rome. The intensive will focus on the Martha Graham Technique and Repertory along with Caterina Rago’s company repertory. Classes will be taught by the foremost exponents of the Martha Graham Dance Company Christine Dakin and Kenneth Topping. The Intensive will culminate with a final showcase performance of participants followed by a panel discussion, documentary and awarding scholarships for prestigious center in New York, USA (Martha Graham Dance Center, Peridance Capezio Center, Limón Foundation, Broadway Dance Center, Steps on Broadway, Gibney Dance Center) and Europe (Graham for Europe, Conservatorio Superior de Dansa de Malaga). Elsa Piperno will teach a one-week intensive at the Accademia Europea di Danza. Recognized as a pioneer in Graham studies, which she introduced to Italy in 1970, Elsa has trained many generations of Graham dancers. At the Alto Jonio Dance Award in Villapiana, Calabria, Graham Technique will be taught by Terese Capucilli, Masha Maddux and Antonio Fini. Terese Capucilli is a former Principal with the Martha Graham Dance Company and an artistic director laureate. She currently teaches at the Juilliard school in NYC. Masha Maddux, is also a former Principal with the Martha Graham Dance Company and founded Wake Forest Dance Festival. Antonio Fini is the artistic director of the Italian International Dance Award of New York. Maurizio Nardi, former Principal Dancer with the Martha Graham Company will be teaching Graham classes at Palermo In Danza Festival in Sicily the last week of August. For the second year, Marnie Thomas will teach a Graham Technique Workshop for Teachers at the Professional Dance Conservatory of Malaga. Marnie is a former dancer with the Martha Graham Dance Company and a former Director of the Martha Graham School. She currently serves as a consultant and rehearsal coach for the Graham Company and is a faculty member of the Martha Graham School, Peridance International, and Adelphi University. The classes for teachers will be from July 2nd to July 6th from 10.00 to 13.00. The master class will be on Friday from 13.00 to 14.30. The workshop is open to dance teachers of all styles, pedagogy students and professional dancers. Read more about last year's workshop here. Nuria Jiménez will be teaching daily Graham classes in Madrid at three different locations: Estudio de Danza Carmen Senra, Scaena Carmen Roche and Tres en Danza. Danza 180° is holding a modern dance intensive with Graham, Horton, Limon and Cunningham techniques. Esther Eiras will be teaching Graham classes. Anna Arboix will be teaching Graham Technique for beginners/intermediate every Thursday of July from 8:30 to 10pm at Sa Nau Dansa in Barcelona. Esther Eiras will be teaching an Graham intensive July 13th and 14th at the Escuela de Danza y Academia de Baile BSdanza in Santiago De Compostela. career with the Martha Graham Dance Company. She is a sought after teacher and coach working with the Kirov Ballet, Japan’s New National Theater Ballet School, the Ailey School, New York University, The Hartt School, L’ete de la Danse (Paris) and is Dance Director for Mishmash*Miki Orihara and Martha Graham Dance Technique DVD(2018). Maggie Boogaart will teach during the Summer Intensive of Paris Marais Dance School at the Centre de danse du Marais in Paris. Maggie is a graduate of the Martha Graham School and has been teaching Graham Technique in the Netherlands and in Paris since 1998. Maggie will teach three different levels Monday to Friday as well as composition and Graham-based repertory of her company. William Crowley will teach Graham Technique during the 4 weeks of August at the Centre de danse du Marais in Paris : two different levels from Monday to Friday and one class on Saturday. William Crowley, received his MFA in Dance from the University of Michigan and additional training at the Martha Graham School. The Perpetuum Mobile Summer Intensive offers dancers a rich program in modern dance techniques with Horton, Graham, Jazz and contemporary classes accompanied by live musicians. Iris Florentiny, former dancer with the Martha Graham Dance Company, will teach a daily Graham class from Monday 20th to Friday 25th. Laureen Elisabeth will teach from Monday 27th to Friday 31st. She is a graduate of the Teacher Training Program at the Martha Graham School and a former member of Graham 2. Penny Diamantopoulou, former member of the Martha Graham Dance Ensemble and current faculty member at the National School of Dance in Athens, will be teaching a Graham Technique Intensive workshop at Fix Dance Studio in Athens from June 18 to July 20 and from August 27 to September 14. This is a preparation workshop for the auditions for the National School of Dance and other Professional Dance schools. Penny Diamantopoulou will be also teaching a Graham Technique Intensive workshop in the island of Zante (Zakynthos), at Palmos Dance Studio. Antonis Sporidis will teach a two-hours Graham class during the Akropoditi DanceFest in Syros Island. Antonis is a graduate of the Greek National School of Dance and has been teaching modern dance in Athens.